BOSTON, Aug. 4, 2015 – Mass. foreclosure petitions rose in June, posting an 81 percent increase compared with June 2014, according to a new report from The Warren Group, publisher of Banker & Tradesman. This marked the 16th consecutive month of increases in petition filings. 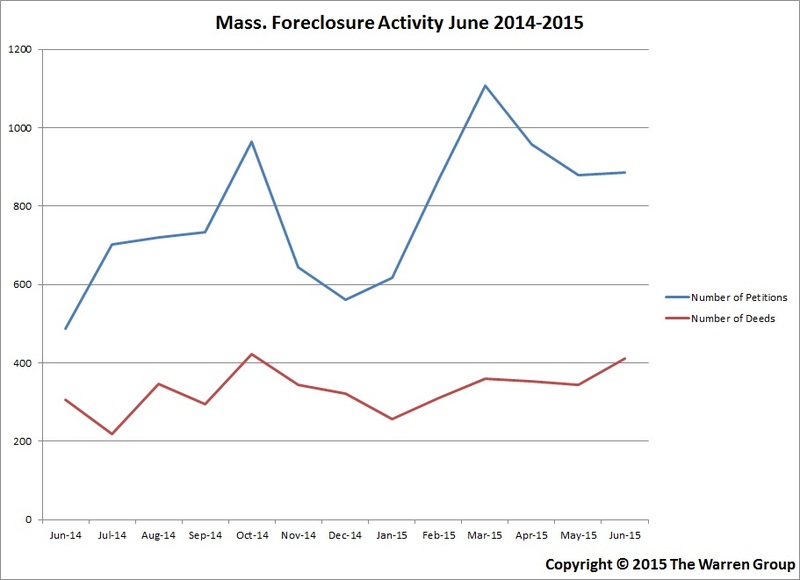 Lenders filed 886 petitions to foreclose in June compared with 488 filings during the same month last year. A total of 5,316 petitions were filed in the first half of the year compared with 3,264 petitions filed during the same timeframe in 2014. That’s a 62.9 percent increase. Petitions mark the first step in the foreclosure process. Statewide, foreclosure deeds reported a 34 percent increase in June with 411 deeds filed compared with 305 filings in June 2014. A total of 2,034 deeds were filed January through June of this year, a 21 percent increase from the 1,679 deeds filed in the same timeframe last year. Deeds represent completed foreclosures. June saw a decrease in the number of auction announcements tracked by The Warren Group compared with a year earlier. There were 504 auction announcements filed, a 4.2 percent decrease from the 526 announcements filed at the same time last year. Year-to-date auctions increased 43 percent with 2,034 auction announcements recorded compared with 1,679 in the first six months of last year. The Warren Group offers a range of real estate products, information services and printed publications, including the newspapers Banker & Tradesman and The Commercial Record. The company also presents and organizes trade shows and events for a variety of industries, including bankers, mortgage brokers, credit unions and lawyers. Based in Boston, the company was established in 1872 and is now in its fourth generation of family ownership and management. For more information about The Warren Group, visit www.thewarrengroup.com.